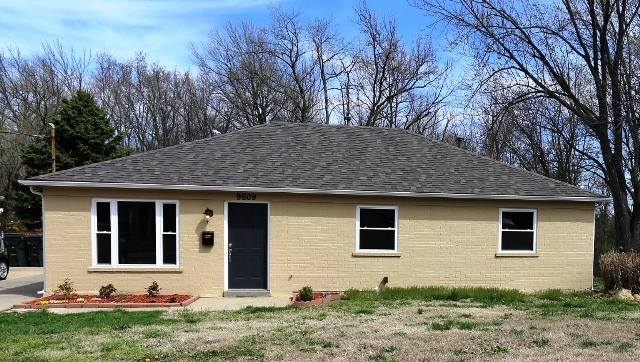 9609 Galene DR in Louisville has been a complete remodel project for Steve Dobbs. We purchased this project in July 2014 and started to work. Our first item of business was replacing the roof on both the house and 1100 foot garage. While the dumpster was there, we did a lot of demo work removing carpet, cabinets, etc. This is what it looks like now as it enters the real estate marketplace. After the roof, we installed new gutters on the house and on the garage as well. This was an all brick home painted light blue with green shutters. We decided to freshen it up by changing the color on the house and garage to match. At this stage, we did not care if there was a little paint on the windows as they were the next to go. We ordered double hung windows with Low-e, Argon filled glass and they were put on in short order. As it was nearing fall, we had the HVAC unit checked to make sure that the air conditioner worked as well as the furnace. There had been some modifications to the house since it was built in 1974 that included two bedrooms combined into one and putting a half wall in the kitchen. We decided to take it back to the original configuration and modernize the house. We re-installed the walls and then added Crown molding through most of the house and increased the size of the baseboards. We also trimmed out all of the windows. All of the interior doors are now 6-panels. I would be the first to admit that the trim is way over the top of what you would expect in this neighborhood, but it was a nice challenge to add all of this. The front and rear exterior doors were aged, and we replaced them as well. As we came into spring, we elected to install a new water heater thinking that was one more worry off the buyer. Our painter was here at the time and we had him paint the water heater closet while it was empty. Speaking of the painter, he repaired the flaws in the walls that he found before he painted. It took him a while, but he did a bang-up job. He painted the ceilings first, then all of the trim, and finished with the walls. The colors work well with the floors and cabinets. One of the last things that we did install the flooring. There was already tile in the kitchen, laundry, and main bathroom. We added ceramic tile to the master bath and chose a nice laminate for the living room, dining room, and hallway. We picked out the carpet and insisted on using 8 pound pad as it gave the carpet a more luxurious feel. We felt the garage was a major selling point and installed a new door and opener with remote. The garage is 1100 feet and big enough for some major projects as it measures 32 feet by 34 feet wide. We mounted the old cabinets from the kitchen in a corner of the garage as we figured this would be a good place to store tools and materials. 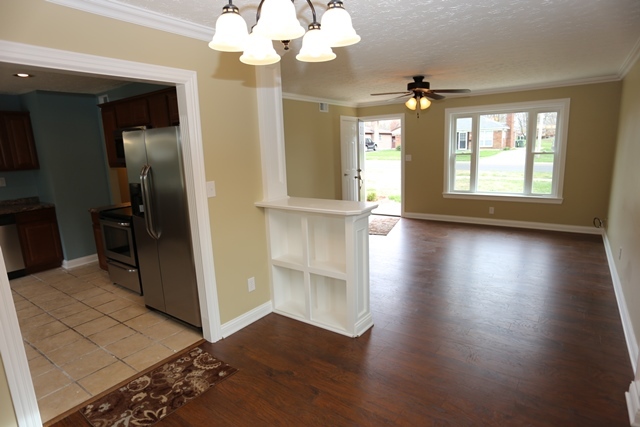 Come take a look at what we have done at 9609 Galene Drive as it is one of the newest homes in Jeffersontown KY for sale. Give Steve Dobbs a call at 502-475-3312 for your private tour today.